This article is the first in a three-part series on packing carry-on-only. Read the rest of the series to learn the principles for packing light and to find our Definitive Carry On Packing List. The first step to mastering carry-on-only packing is to know the rules. Always use the measurements from your airline’s website. Those measurements will be the most accurate. Be wary of third-party sites that aggregate information for multiple airlines as their measurements may be inaccurate or outdated. The most commonly allowed size for carry on luggage is 45 linear inches (length + width + height). 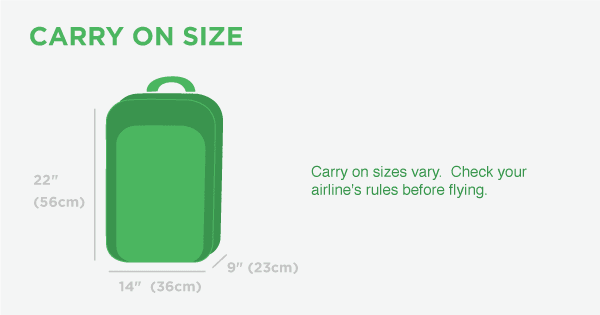 Some airlines allow larger bags, but forty-five inches is a reliable baseline to use. Airlines that give measurements by dimension typically allow bags up to 22 x 14 x 9 inches. Some airlines allow bags that are larger in one or more dimensions, but this configuration will meet the guidelines for most major airlines. We used these measurements to maximize packing space in the Outbreaker travel backpack while still keeping it carry-on-eligible on most airlines. Budget airlines like Ryanair are the most common exceptions to these norms. Cheaper airlines are often more strict with luggage size rules. 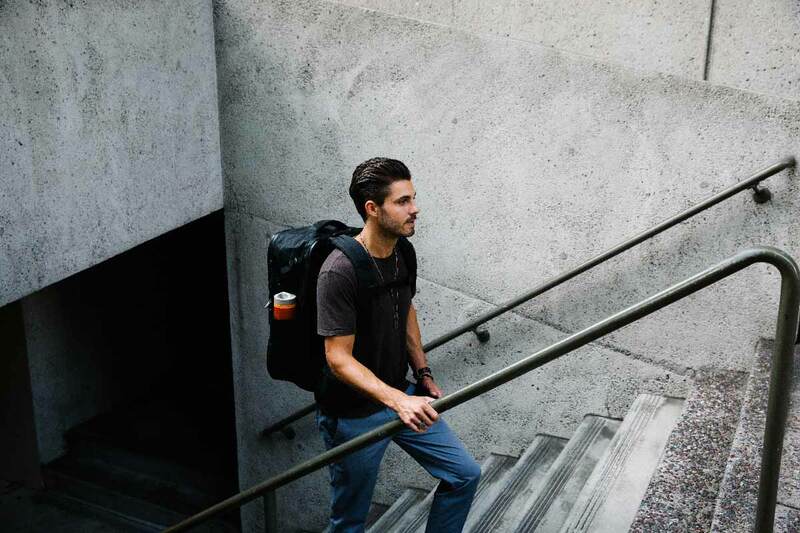 Happily, the Outbreaker 35, the smaller, lighter of the two travel backpacks in the Outbreaker collection, is perfectly suited to the more restricted size guidelines on budget airlines. Check your favorite airlines’ rules before buying new luggage. In addition to your carry on luggage, most airlines also allow one personal item, like a purse, daypack, or laptop bag. Your personal item must fit under the seat in front of you. Very few airlines publish size rules for personal items. United’s new baggage policy allows items up to 17 x 10 x 9 inches. If your airline doesn’t have specific size limits, use United’s rules as a guide to determine if your personal item will fit under the seat. 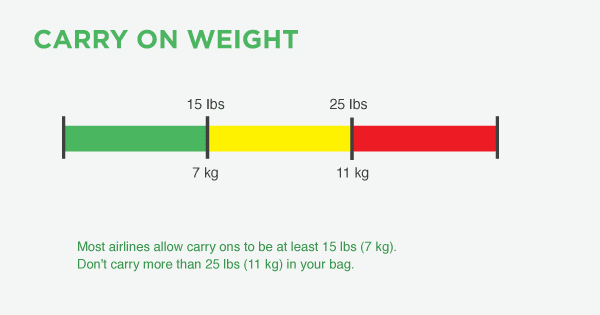 Carry on luggage weight rules vary even more than size rules. Some airlines allow carry on bags weighing up to fifty pounds. Even if you’re allowed to carry 50 pounds, you probably shouldn’t do it. Lugging that much weight around defeats the purpose of packing light. Instead, aim for the low-end of allowed weight: 18-25 pounds. Some budget, European, and Asian airlines only allow carry on bags up to 15 pounds. Make sure to check with your airline before flying. A $20 electronic luggage scale will pay for itself by helping you avoid fees for overweight luggage. The rules for carry-on-sized toiletries in the United States are set by the Transportation Security Administration (TSA). Toiletry size rules are consistent around the world. 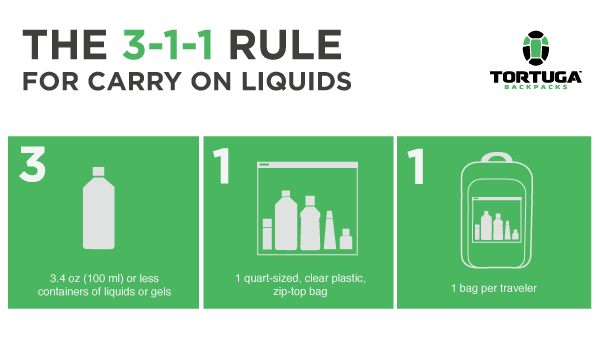 Your liquids and gels must be in 3.4 ounce (or less) bottles. Those bottles must fit into a one quart plastic bag. Each passenger may only carry one such bag. For more details on these rules, refer to the TSA’s website. Frequent travelers should consider applying for TSA PreCheck. Once approved, you’ll have access to an expedited screening process including a separate security line. In the PreCheck security line, you can leave your laptop and liquids in your bag and don’t have to take off your jacket or shoes. PreCheck is the closest you can get to being treated like a human being at the airport. The PreCheck program costs $85 for 5 years. If you travel abroad, join Global Entry. Global Entry offers all of the benefits of PreCheck plus expedited re-entry into the United States for $100 for 5 years. Before flying, always check your airline’s carry on luggage size and weight guidelines. A good rule of thumb is that your carry on luggage can be up to 45 linear inches (length + width + height). The most common configuration is 22 x 14 x 9 inches, the dimensions of the Outbreaker travel backpack. Keep your luggage to under 25 pounds. All toiletries must be in 3.4 oz (100 ml) or smaller bottles. Those bottles must be in a single quart-sized, clear, plastic, zip-top bag.